Discover Luxury Camping in the Himalayas! Tucked away in a landscape that only dreams are made of, is a fascinating and exclusive experience that Enchanting Travels is delighted to feature in its 2016 collection. Find yourself swaddled by some of the highest peaks in the world. These same mountains have protected the many travelers who had journeyed through here on the renowned Silk Route from China to Persia for centuries. 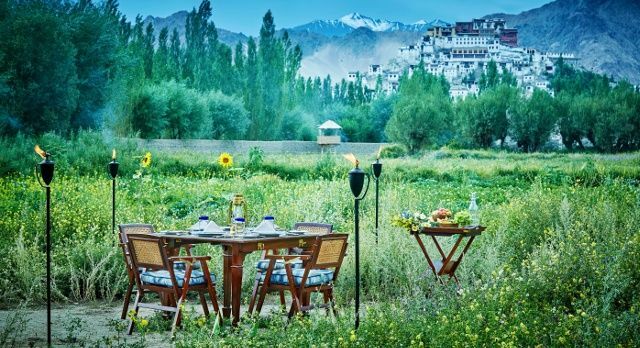 Ladakh is located over 10,000 feet above sea level, encircled by the sanctuary of the mighty Himalayas and blessed by extremes – from white sand dunes and deserts to crystal blue waters and glaciers. 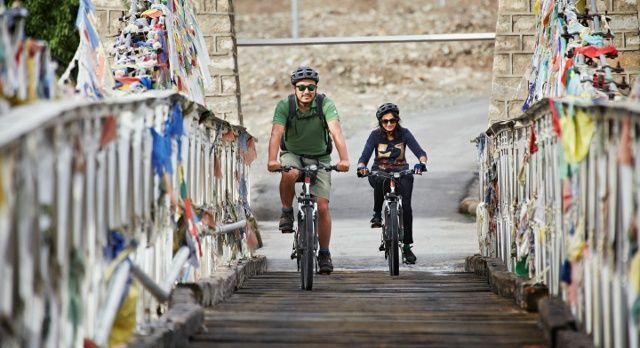 Ladakh has always been a remote destination sought out by the most adventurous and soulful. 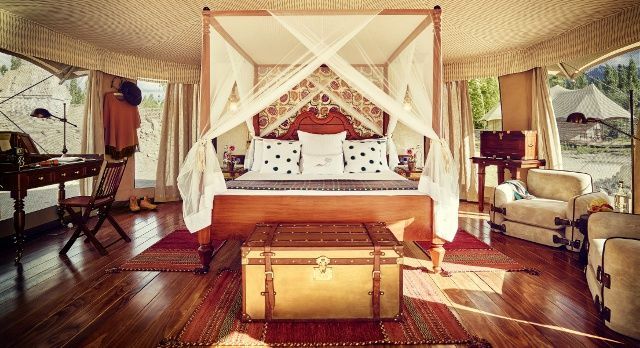 Yet, a clique of seasonal luxurious tented camps is opening up this region to the more discerning and chic travellers. 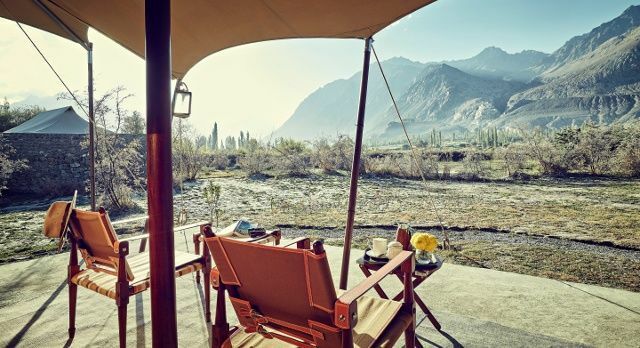 The Ultimate Travelling Camp has delicately created cocoons of authenticity with a heavenly dose of grace, ensuring a tranquil and off the beaten path experience. This is the ideal cultural retreat for guests who are seeking unparalleled travel encounters while maintaining assured stylized tented comfort – including chandeliers. You will have your own personal butler to serve you. 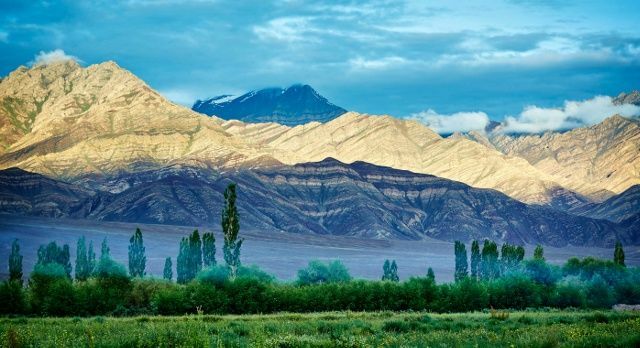 To the north east of the region, discover Nubra Valley – Ladakh’s summer orchard, known as the valley of flowers. Yet in winter, the same valley becomes ethereal. In Lamayuru, discover desert moon landscapes. How you explore the region’s natural beauty is entirely up to you. You may wish to take it slow with a guided trek, or on a cycle ride. Alternatively, upon the back of a Bactrian camel is a historic way to explore the stark scenery of the hamlet of Hunder (land of the sand dunes). When you are not enjoying picnics, embark on a spot of archery or attend a polo match alongside the local ethnic peoples. Dotted with ancient Buddhist monasteries, it is easy to surrender to a spiritual life within these divine landscapes. You can venture to Thiksey Monastery for early morning prayers, or visit the oldest institution, Hemis Monastery. For a truly mystical moment, observe a spiritual séance with the Oracle. Evenings can be spent unwinding with the stunning sunsets over the Shanti (peace) Stupa, or with a private outdoor BBQ set up in a picturesque spot inside the campsite, just for you. You can also experience the romance of former glory days at the abandoned ruins of Leh Palace in Thiksey. The people of Ladakh have their roots in the Indus Valley civilization, one of the oldest in the world, and you will notice that the local villages are ancient in their culture and barely touched by the passage of time. Through personal relationships with the communities in which it operates, The Ultimate Travelling Camp provides you access that few can. This exclusive glamping adventure ensures you are welcomed into the homes of humble, genuine local people, to guzzle up a traditional tea experience. In the Land of the Lamas, bring your curiosity, leave a few footprints, and take away a million extraordinary memories. Ladakh is accessible with daily flights from Delhi. Combine the beauty of Chamba Camp in Thiksey and/or Chamba Camp in Diskit, for a minimum of four days/three nights getaway, beginning with your welcome into Leh, the capital of Ladakh. The temporary camps are in season from 15 May to 10 October each year, when you can encounter frozen beauty dappled with blue skies and sunshine.